The Tano Indians were the first people in the Cerrillos area. Their pueblos, large and small, were spread out randomly through the Galisteo Basin. Archaeologists believe these sites were occupied by the Tano with no more than a few thousand at one time. Some of the pueblos may have been abandoned when the farm lands wore out. Evidence has shown farm land (Burnt Corn Ruin) five miles east of Cerrillos were destroyed in battle. Tumbled stones, broken potsherds, and discarded tools of rock were discovered as records of their passing. Many materials were mined out of Cerrillos. A Spanish explorer, Antonio de Espejo, wrote about these treasures being mined at a place of “little hills." This is the source of Cerrillos' name. The Pueblo Indians extracted turquoise from the hills; the Spaniards found gold, silver, and lead. The Tano Indians were used for slave labor to mine these materials out of the hills, but several cave-ins made the Tano stop their excavations. They protested mining and covered up any existence of the mines, which lay dormant for 150 years. Cerrillos was rediscovered in 1879 by two prospectors from Leadville, Colorado. Word spread fast of the treasures and soon many miners swarmed the hills of Cerrillos. The town became well known and people came from around the world to mine these materials for profit. The settlement started off as a tent city but soon grew into a town of many buildings, homes, a church, a school, and stores. The rapid growth of Cerrillos gave opportunity for people who moved in. Hotels were built along with saloons, dance halls, shops, and short-order houses. There were not only profits for miners but businesses that provided for them as well. One of the town’s leading businesses was the Cerrillos Supply Company, which stocked equipment miners needed--shovels, picks, tools, steel and fuses, to name a few. By 1900 the mines began to shut down, and the booming town started to dwindle. A fraction of the population stayed in Cerrillos. Today, only a few of the buildings from Cerrillo's boom remain. Some of the buildings still show evidence of past movies filmed ("Young Guns" and "Outrageous Fortune") on Main Street. The church still stands at the end of Main Street and the local people attend mass on Sunday. A few businesses are open that tourist and locals can use, along with a petting zoo and a trading post featuring Cerrillos turquoise and a mining museum. 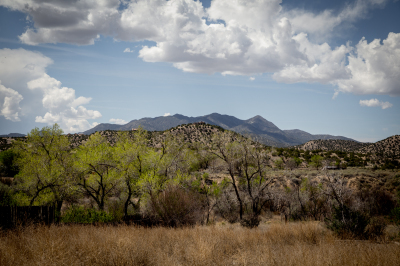 Cerrillos Hill State Park has 5 miles of multi-use trails with an ADA trail to the village overlook.